Ticket for 35km over, help with disclosure appreciated! 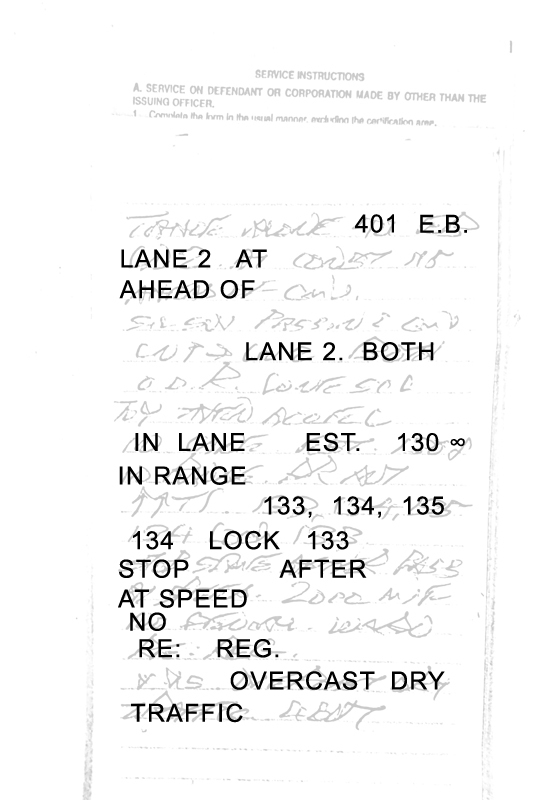 I received a speeding ticket last February heading eastbound on the 401, just east of Cornwall. The OPP officer pulled me over, told me that he had me going 31 to 35 km over the speed limit, then gave me a ticket for going 135km in a 100km zone. He didn't mention anything about the instrument he used (radar, lidar etc). I described the situation to another police officer who said that he likely paced me (he was beside me, then slowed down, came into my lane behind me and turned on his lights ÃƒÂ¢Ã‚â‚¬Ã‚â€œ I seriously doubt he paced me long enough to get an accurate read on my speed). Anyways, I asked for the ticket to be taken to trial, and last week received a court date for early July. This leaves me about 5-6 weeks to request disclosure and prepare myself. I'm going to fax in a disclosure request form tomorrow, however I'm worried that it's not going to be enough time for them to get me the disclosure, and I'm feeling kind of cheated that they only left me 6 weeks to ask for disclosure and prepare. I live in Toronto and the trial is taking place in Cornwall. I understand that I can show up and say that I didn't receive my disclosure and have the trial adjourned, but that would require me to make multiple trips to Cornwall for this. Does anyone have any advice/tips with this? Is this standard practice with Cornwall? Also, what should I mention in particular in the disclosure? I'm going to use the standard template from ticketcombat (http://ticketcombat.com/step4/disclosurehow.php) - is there anything else that I should ask for? Make/model and manual for radar gun used? Calibration records? Or is all that information provided with disclosure? This is my first time fighting a ticket so any advice (regardless of how common sense it seems) is greatly appreciated. Re: Ticket for 35km over, help with disclosure appreciated! Just an update - I received disclosure today, however the cops notes werent typed. If anyone is good at reading crappy hand writing I can upload a copy - I need all the help I can get in deciphering what's written. I received a copy of the officer's notes, however they are very hard to read and I can not decipher most of them and am therefore unable to make full answer to charges. I am requesting a typed copy of the officers notes, and please also included the meaning of any shorthands used. Thanks! I'm going to give that a shot! Usually if you get the disclosure 2 weeks or more ahead of time, that should be enough time to prepare. If you have not received it with less than 2 weeks to go, then contact clerk of the court and try and get them to reschedule because of the distance. If they won't do it, then contact prosecutors officer and see if they will ask for a rescheduling. Upload a copy of what you have anyway. Maybe we can decipher them. jsherk wrote: Usually if you get the disclosure 2 weeks or more ahead of time, that should be enough time to prepare. argyll wrote: Upload a copy of what you have anyway. Maybe we can decipher them. That's pretty bad handwriting. Doesn't seem like a lot of notes either. The first two pages of notes are his general daily notes. It shows devices tested at the start of the shift, in between, and at the end (Decatur Genesis II Select Directional). The rest of the info is blacked out because they discuss details irrelevant to your stop. It's hard to make out the notes. The gist of it is you were spotted at an estimated speed of 130+. Radar was used, device showed 133, 134, 135 then back down to 134. Officer locked the speed on the device at 133. I tried to make out the notes but they're hard to read. Maybe someone can fill in the holes or correct anything that's incorrect. argyll wrote: That's pretty bad handwriting. Doesn't seem like a lot of notes either. bend wrote: The first two pages of notes are his general daily notes. It shows devices tested at the start of the shift, in between, and at the end (Decatur Genesis II Select Directional). The rest of the info is blacked out because they discuss details irrelevant to your stop. I'm not sure if I should plead guilty to a lesser charge, or hand this over to a paralegal? If he had me on a radar at 133 then I dont have much of a case, right? Also side note - the ticket was for 135, but he had me on the radar at 133. I dont know if that changes anything since speeding is still speeding? Thanks again everyone, I really appreciate the help! Lock speed does not matter. It's the highest speed that the officer SAW on the radar that they can charge you with. It appears that the officer has the test times mentioned both before and after your stop. If money is an issue then you might want to take a plea deal if offered by the prosecutor. Otherwise you could take the time to fight it (you will most likely lose) and consider it an education in how our legal system works. Personally I would make another disclosure request asking for a typed copy of the notes including any shortforms used, as the notes are mostly unreadable and therefore you can not make full answer and defense to the charge. jsherk wrote: Lock speed does not matter. It's the highest speed that the officer SAW on the radar that they can charge you with. Yeah I figured the lock speed doesn't really matter. I've requested disclosure with typed notes, I dont know when/if they will give them to me. I also requested a copy of the radar manual and other things (eg make, model, and serial # of the radar), all of which were not provided - will this help at all? Adjournment? Radar make, model and serial number were all provided in the officers notes. Don't expect to get the radar manual, it usually isn't provided. The most you'll get will be the testing instructions and probably an opportunity to view the manual. If you dont get the additional disclosure about two weeks before trial, the best you can hope for is an adjournment to another date.